During the war, I had not forgotten to keep a close eye on the trading screen every turn, looking for possible trade opportunities. Saladin was far ahead of me of course, but lacked some techs the other AIs had - and so, more n-fer trades were possible. 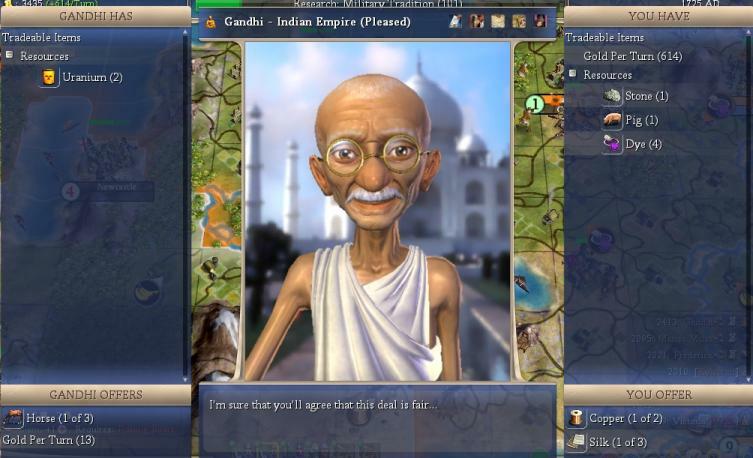 I bought all my techs from Rome even though Gandhi was still willing to trade with me, because Gandhi was the tech leader now, and I felt I had to move against him sometimes in the future. 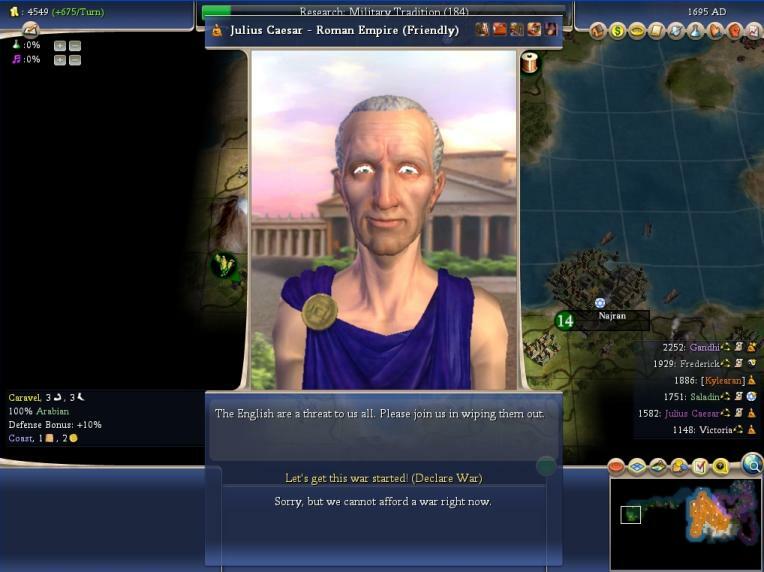 So I decided to give Rome my money, to strengthen Caesar so he could be a useful ally later on. In 1685AD, he declared war on Victoria, and two turns later asked me to join his war. I had planned to attack her anyway, so gladly accepted and got another relationship bonus with Caesar. 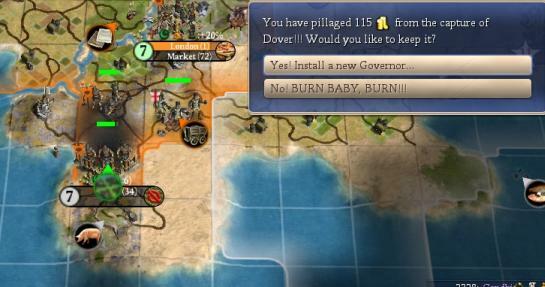 My stack of macemen, pikes, and (newly-built) catapults quickly captured Dover. It was a bit harder to fight her now than during the previous war. The reason for this can be seen in the screenshot above: Look with what she guarded her iron...she had grenadiers now! It was the 18th century, and I was forced to fight strength 12 grenadiers with my strength 8 macemen. Rome, on the other hand, was running around with cavaly already. So now that I had guilds, I took a look if there were some spare horses on the market. There were. Not only had he horses, Gandhi actually also had uranium already! 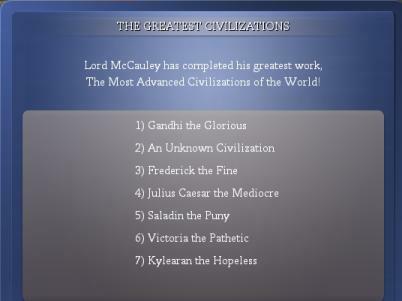 Never before had I been so behind in a Civ 4 game - this really felt like Civ 3 Deity, in a positive way. 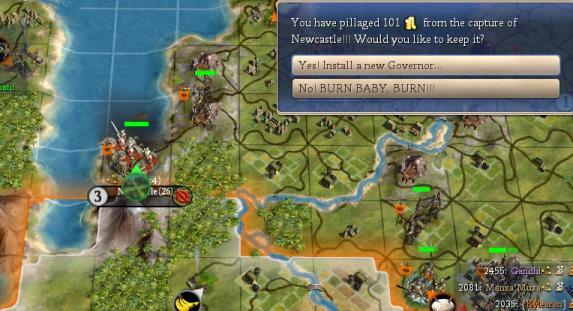 At least I could build strength 10 knights now; still weaker than the grenadiers, but with the help of some collateral damage, I took Newcastle next. Luckily Victoria had only a few grenadiers and mostly longbows, and also was quite distracted by Rome as well. 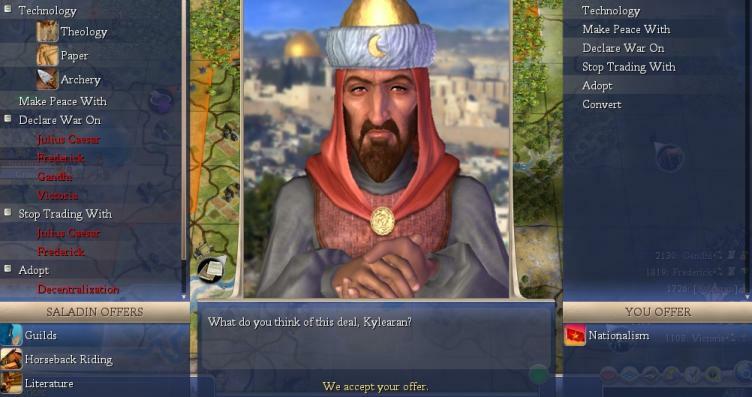 Additionally, in 1740AD I made one of the most important trades in this game: For 5200 gold, I bought Military Tradition from Mansa Musa, whom I had met some turns before. I had horses, one of my three great engineers had built the Heroic Epic in Moscow several turns ago, and now I had Military Tradition - cossacks time! Grenadiers are no match for cossacks of course, so Coventry fell quickly. Dover was a bit harder to take, as now Victoria had redcoats, but in the end my cossacks proved to be superior. Taking these last two cities were the only time during the whole game where I actually had units to fight with that were a match against those of my opponents! Happiness was a big problem, though. Not only did I suffer from increasing war weariness, I also had 3 unhappy faces in every city because my citizens demanded emancipation! I had to run 50% culture in the end to keep them happy. Canterbury and Warwick had been taken by Rome already. I didn't see an English border anywhere and believed Victoria to be in exile on an island somwhere, so I made peace again, getting my first tech out of a war from her: Banking. 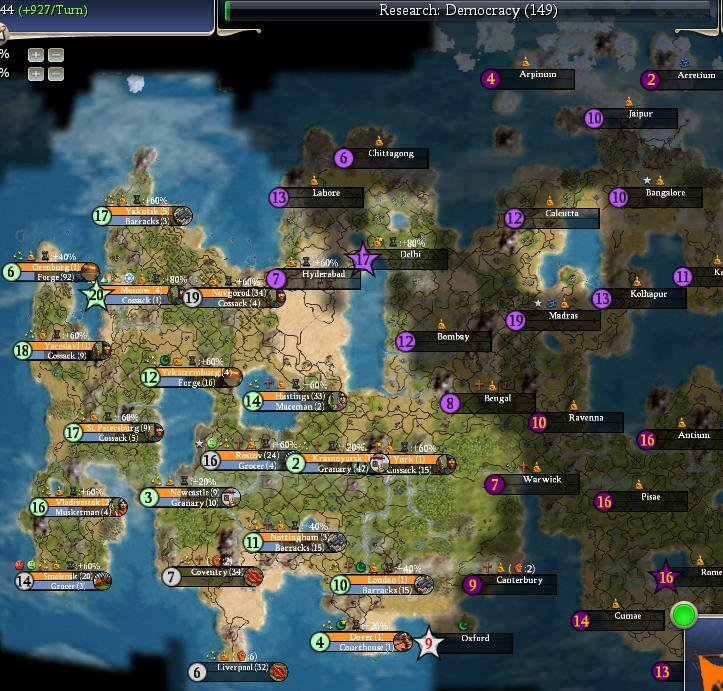 Finally, in 1780AD, I was able to build cheap banks which helped my 0%-science economy a great deal! That would haunt me later in the game, and painfully so! At that time in the game though, I was also unable see Oxford, Warwick, Canterbury, and half of Rome and India; I simply had failed to scout their lands because I hadn't anticipated I would be unable to afford to buy maps, which I normally do when gold wasn't needed so desperately to try to catch up in tech. I learned a lesson here!